The EL2535, EL2535-0050 and EL2535-0002 output terminals control the output current via pulse width control of the supply voltage. They are galvanically isolated from the E-bus. The current value 0 up to maximum output current (1 A, 50 mA, 2 A) is specified by the automation device via a 16 bit value. The output stages are protected against overload and short-circuit. 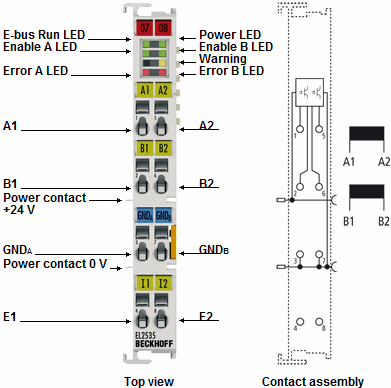 The EtherCAT Terminals have two channels that indicate their signal state via light emitting diodes. The LEDs simplify local diagnosis by displaying typical load and wiring faults. Short circuit current typ. < 2 A ≤ 500 mA typ. ≤ 4 A typ. Special features Stored valve characteristic curves can be retrieved; two 24 V digital inputs.